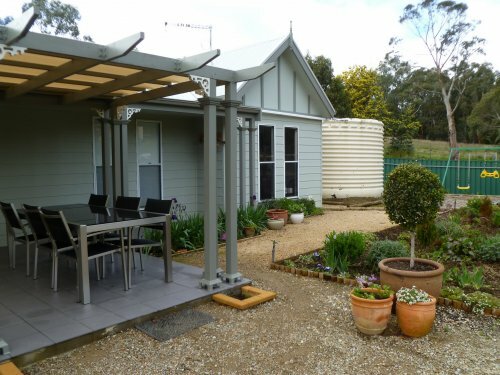 Our newly built and easy to maintain home in the Adelaide Hills frees us up for travel especially in the Australian winter months. With no grass to mow, no watering of plants (watering system if needed) and no animals to care for, general maintenance is easy. The garden with no lawns at all is primarily herbaceous although this is reduced by a graveled driveway and paths, a large patio area with barbecue as well as a play area for the grandchildren. 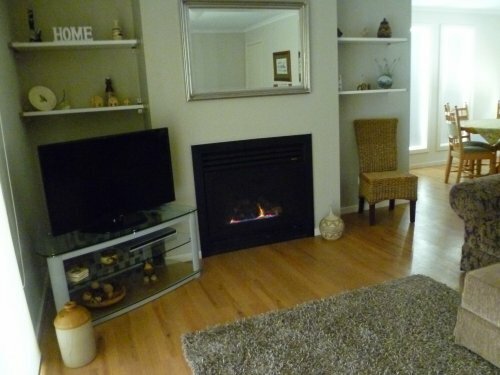 Our house has an open plan living area with a gas log fire for the Hills winters. 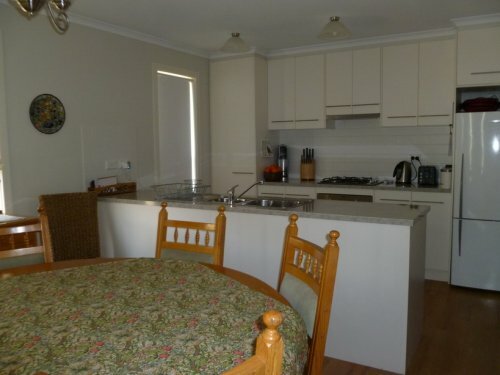 Three bedrooms provide sleeping accommodation for four and a well set-up office. 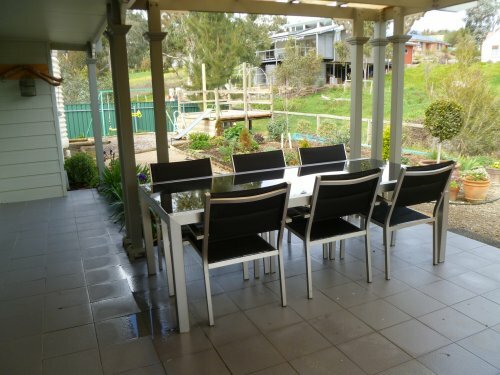 Large sliding doors look out on to the patio, garden and feeding platforms for local birds from rosellas to galahs and cockatoos. These colourful Australian birds visit our garden daily. Echunga is a small town in the Adelaide Hills, an area well-known for rolling hills, interesting historical towns and villages, wine estates and general beauty. Echunga has a general store, hotel, bakery, post office and excellent public golf course plus other sports fields. A good freeway joins the Hills area to Adelaide itself connecting Echunga to the city in just over half an hour. 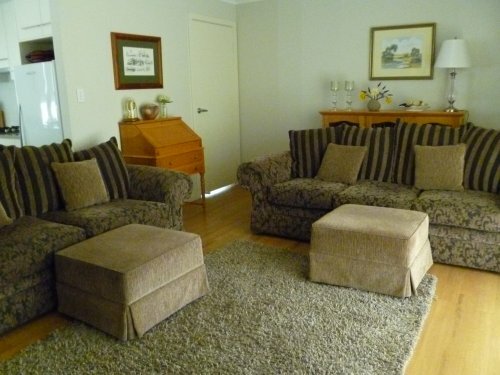 Mount Barker is a growing town serving the area with all shops and amenities needed. This is 10 minutes from Echunga through pretty farming countryside. 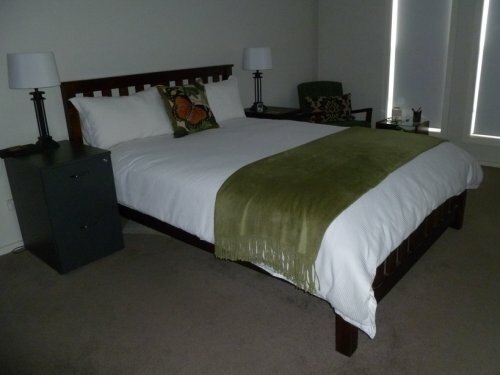 Popular Hahndorf with beautiful scenery, shops and coffee shops is just 10 minutes away. The Barossa and McLarenvale wine regions are easily reached on country backroads. The coastal towns of Goolwa and Victor Harbor are about an hour south with other pretty towns such as Strathalbyn on the way. All in all,the Adelaide Hills is a much sought after area for both residents, tourists and day-trippers. Our names are Owen and Diann. We are a young-at-heart couple (married for 47 years) with a great love of travel. South Africa, Australia and Fiji have all been countries we have called home plus crossing the Pacific on a yacht and then living on it for 4 years! We returned to retire in Australia two years ago. 3 of our 4 children live in Adelaide giving us good access to our 9 wonderful grandchildren (and their parents!) Our youngest daughter lives and works in London. We are both non-smokers.